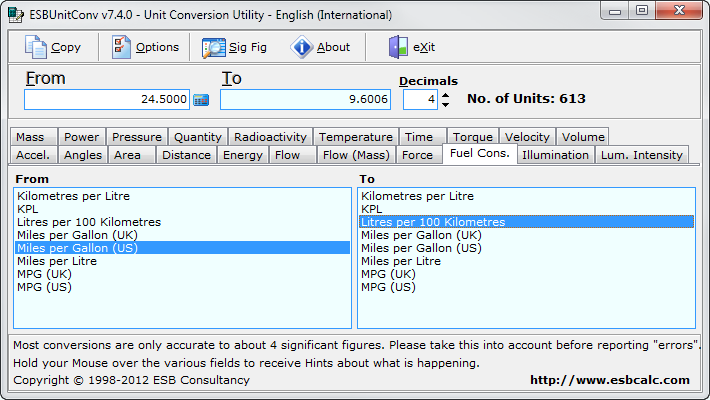 ESBUnitConv is a Free User-friendly Windows Utility to easily convert between units of measurement. Includes Units for Temperature, Distance, Mass, Area, Volume, Pressure, Velocity, Acceleration, Force, Energy, Power, Fuel Consumption, Flow, Torque, Angles, Luminous Intensity, Illumination, Time, Quantity &amp; Radioactivity. Works on Windows 98, Windows Millennium, Windows NT4, Windows 2000, Windows XP, Windows 2003, Windows Vista, Windows 2008, Windows 7, Windows 8 and Windows 10. The visual appearance of ESBUnitConv has been optimised for 800x600 (or better) with 16-bit colour (or better). It looks really great under Windows XP/Vista/7 with its 32-bit colour. You will also get the "nicer" buttons on Windows XP and above. Also includes customising of the Colours &amp; Fonts used, as well as customising how the Hints (ToolTips) appear. 330 531 ESB Consultancy <img src="https://www.oldergeeks.com/downloads/gallery/thumbs/esbunitconv1_th.png"border="0"> Nov 18, 2018 - 11:56 7.4 1.24MB ZIP , out of 1 Votes.